Family Friendly Varied difficulty of terrain, ease of access. The park will close if conditions warrant. Closures are posted to Denver Parks and Recreation's Twitter and Facebook accounts for more info. Located in the heart of Denver, this park offers quick access to singletrack. 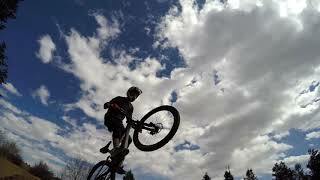 Beyond that, it offers world class slopestyle lines, so come for the singletrack, but stay for the skills progression! There are a number of road crossing and portions of this loop follow multi-use trails. Be alert and prepared to yield appropriately. Often kids come out to enjoy these trails, so set a good example! There aren't any water or flush toilets on site (yet). The park is still being developed/constructed. Ride the XC Loop that surrounds Ruby Hill Bike Park. There is a sign at the trailhead stating direction of travel, by month, but most users ride clockwise year-round. Ridden clockwise (as mapped), you'll encounter a short, steep ascent, then be rewarded by a mostly long, flowing descent. It is recommended to be ridden in this direction for the highest fun factor. Starting at the trailhead marked on the access road, you'll climb a few switchbacks before attempting the headwall of the climb - to the top of the slopestyle lines. Many riders walk this steep, loose section, but it is rideable. After reaching the top, you'll follow the leftward singletrack and flow a little down, a little up, around the community garden, and then across the street to follow the trail. This is one of four total street crossings, so watch for cars. As you cross the street, you'll head down a paved multi-use path for ~50ft, then veer left to continue on the dirt singletrack. Following the sidecut, you'll snake back across the multi-use path once more, before enjoying a flowy open field section of singletrack. You'll cross the road once more, this time close to a busier street, so watch for quick moving vehicles. After this crossing, you'll wind through some trees with a little climbing, cross the multi-use path once again, and then enjoy the woodsy, descending switchbacks. Watch your speed - these are tight and often loose. Crossing the road again, you'll enter another high speed section with optional wooden kicker/roller feature. The trail follows the edge of the baseball fields, and gently climbs back to the original starting trailhead (and final road crossing segment). This trail can be ridden in either direction, so be mindful of other users, and have fun. Berm on Small Slopestyle Line. Slopestyle and dirt jumps at ruby hill.